This perhaps the most interesting means to market a video game that I’ve ever seen. But you can win your very own real-life island by participating in a Just Cause 3 competition. North American gamers who pre-order the Just Cause 3 Day 1 edition have a chance to win their own real-life island. 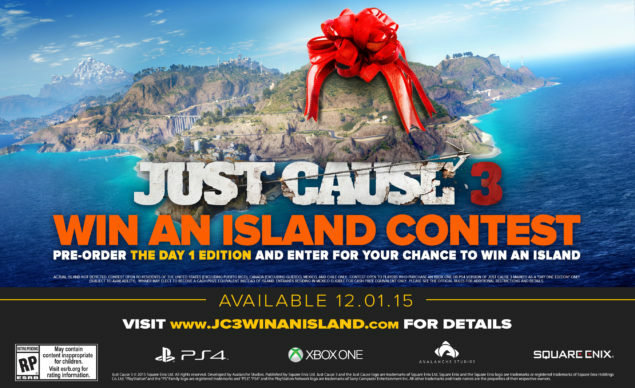 The Just Cause 3 Win an Island Competition will begin on Dec. 1, 2015, the games launch, and run for 90 days after. In order to be one of the lucky participants in this most fascinating of contents, you have to pre-order the Just Cause 3 Day 1 edition for PlayStation 4 or Xbox One. So it’s a console only affair it would seem. The contest will be an exercise in destruction. You’ll race to score the most Chaos Points by crying havoc and unleashing the dogs of war all over the in-game island of Medici. The more creative and inventive the mayhem, the more Chaos Points you’ll be able to earn, with an actual island being the grand prize. Details around the contest can be had right here. The prize is on the more extreme end, with the value likely exceeding the typical contest you’ll see. I can see many people taking 90 days off of life (and work) to try to win this most precious of prices.